Transport for London (TfL) has been told by the Mayor of London to identify a new location for the Victoria Coach Station when the building lease expires and Crossrail 2 begins work. We understand that the only location TfL is considering is a strip of land along the railway tracks by Royal Oak, where TfL propose to build a coach station and then luxury tower blocks above , polluting our neighbourhood and blighting our landscape. The St Marylebone CE School is seeking a sponsor for its publication St Marylebone Messenger. This journal collects news, essays and artwork by young people aged 11 through 18 at a very high standard, worthy of publication. The School is hoping to expand the remit of the journal to include some of the most outstanding pieces produced by A-Level students. 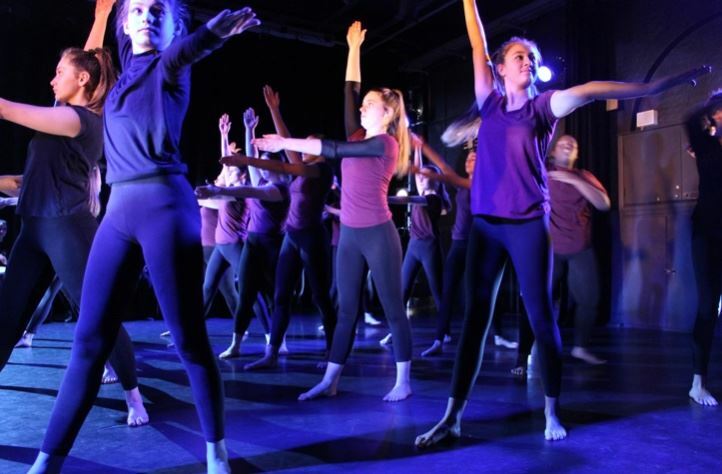 Under significant financial constraint, the School is seeking a sponsor for this, so that the students’ work is published in a high quality style and format equal to the calibre of their excellent work. To produce 50 copies of the journal in colour requires £400 annually. If you, your company or someone you know would like to sponsor St Marylebone Messenger, your name or logo can appear on the cover and we can offer a page inside the journal for information you’d like publicised*. Please contact the Headteacher, Ms Kat Pugh, at the School on 020 7935 4704 or email k.pugh@stmaryleboneschool.com if this is of interest to you. *As a state-funded school with a commitment to public service and equal opportunities, we reserve the right to determine what is reasonable and appropriate in terms of sponsorship material. The School is an exempt charity, regulated by the EFSA, company number 7719620, registered with JMRC, Charity Reference EW 09072. This is the second newsletter for the redevelopment of Moxon Street Car Park, being delivered by Concord London. This newsletter will provide an overview of the works planned up to Christmas and the upcoming enabling works as work commences on site. Kier has been appointed as the main contractor for the project and will commence work on site from Monday 3rd December. A dedicated project website - www.moxonstreetcarpark.com - has been set up to provide regular updates and information on the project. The website contains the latest news from the site, contact details and information on forthcoming works. A Community Liaison Group (CLG) has been formed of local residents and stakeholders who meet regularly with the project team to give feedback and to raise any concerns that they have. If you would like to receive email updates about the works, including information on about CLG meetings and minutes, please contact Four Communications using the contact details supplied. The next CLG meeting will take place on Monday 3rd December, starting at 6.30pm, taking place at Aubaine Marylebone, 7 Moxon Street. If you would like to attend, please let Four Communications know using the contact details provided. • Closure of the car park to public vehicles at the end of October. Please note that the London Farmer’s Market will continue to operate every Sunday but will be located on Aybrook Street from this time. Surveys of the pavement vaults around the perimeter of the site (these are the vaults associated with the terraced housing that used to occupy the site). • Commencement of an Unexploded Ordinance Survey (UXO), which will continue until mid-December. • Kier will be installing a temporary hoarding around the site from Monday 26th November for security in preparation on for the start of the main works on site. Initially, this hoarding will be positioned on the pavement and will progressively move out into the road, eventually sitting outside of the kerb edge. • From Monday 3rd December the remaining preparatory works will continue on site, including excavated of the pavement vaults at the edges of the site and removal of the remaining car park tarmac. • Disconnection and removal of the street lighting adjacent to the site and its replacement with lighting on the temporary hoarding. Note that street lights on the opposite side of the street will remain. • Installation of six site cabins on site. We expect this phase of the works to be complete by the end of January. All work on site will be carried out in accordance with Westminster City Council’s Code of Construction Practice. The site will be registered with the Considerate Constructors Scheme. What should £670,000 of CIL money be spent on in Marylebone? 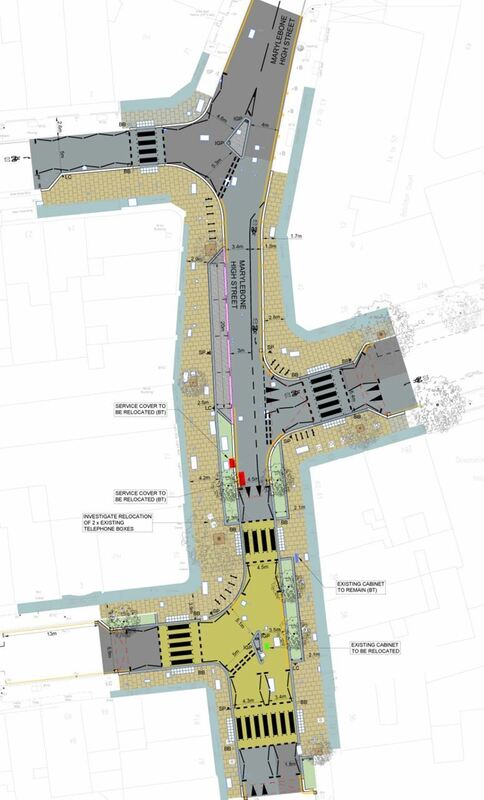 The Marylebone Forum are consulting on what £670,000 should be spent on. The Community Infrastructure Levy (CIL) is a tax that local authorities charge developers for infrastructure needs arising from new developments. As part of the Marylebone Low Emission Neighbourhood (LEN), Westminster City Council is proposing to introduce a number of new measures around Marylebone High Street and Paddington Street. These interventions will sit alongside the behaviour change measures already undertaken as part of the LEN programme. Details of these proposals are set out below, showing the existing and proposed arrangements, as well as information on the rationale. Once implemented, these proposals will be the first of their kind in Westminster. If you would like to comment on the proposals or have any questions, please email info@marylebonelen.org by 11.59pm on 5th December 2018. Responses will be considered before proceeding with the next stages of design and implementation. Introduction of a new pedestrian crossing on Paddington Street, helping to link the north and south side of Paddington Street Gardens. Edgware Road: Proposals for new pedestrian crossings, improved junctions and introducing a 20mph speed limit. TfL also proposes to reduce the speed limit from 30mph to 20mph to reduce the number of collisions on Edgware Road and their severity. Visit: https://consultations.tfl.gov.uk/roads/edgware-road/ to view TfL's plans and provide your feedback. Construction work starts on the Moxon Street Car Park site. The initial programme is as follows. Following the withdrawal by Westminster Council from the Mayors unpopular plans to pedestrianise Oxford Street, Westminster have now formally announced a radical new plan to put £150 million into improvements over the whole Oxford Street district. These improvements, as the name of the strategy implies, intend to treat the West End area around Oxford Street holistically; investing in, but protecting the neighbourhoods that surround Oxford Street and improving Oxford Street itself whilst still maintaining its important function as an east west axis for a reduced amount of buses and taxis. 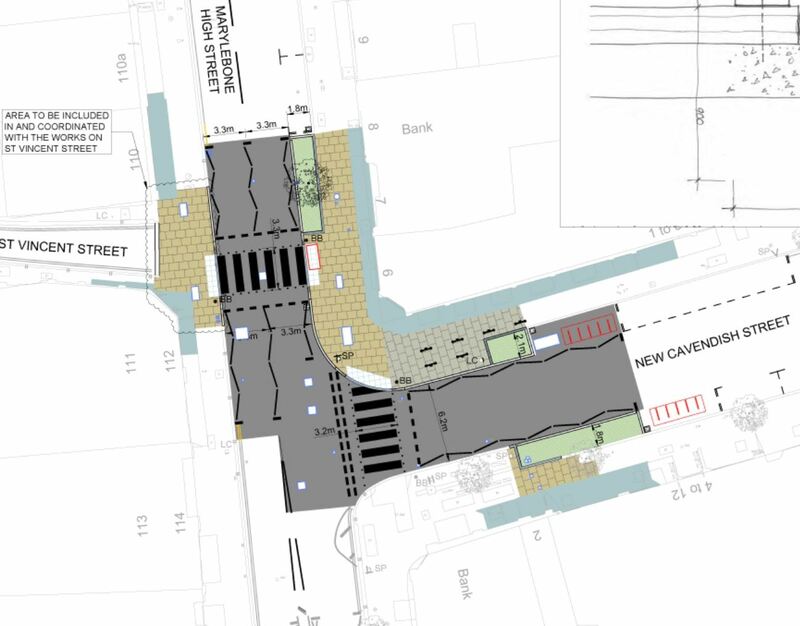 Safety issues stemming from the projected increase in pedestrian numbers from Crossrail, when it finally opens, will be also dealt with by various measures, including the widening of the existing pavements where necessary. 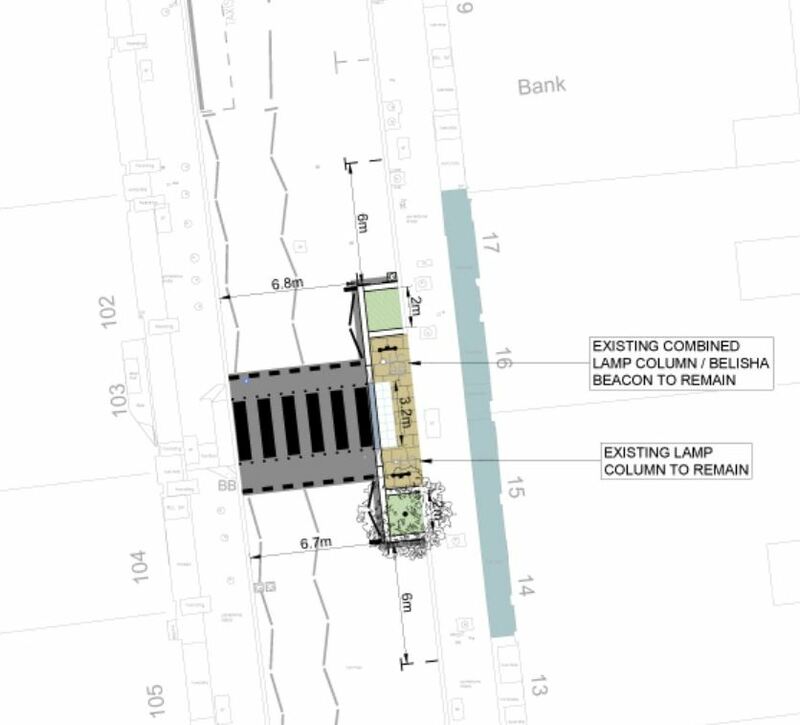 Prioritise pedestrians by massively increasing walking space throughout the whole district whilst retaining two-way vehicle movement along the length of Oxford Street. It’s proposed to create the equivalent of two Trafalgar Squares of additional pedestrian space amidst beautiful new public spaces. Major improvements are proposed at key locations, including a new public piazza style space at Oxford Circus and a reinvigorated gateway to the West End at Marble Arch. Retain buses on Oxford Street 24 hours a day and ensure they are zero emission. Encourage cycling by retaining access for cyclists to Oxford Street and develop proposals for new cycling routes across the district with two new east–west cycle routes, to the north and south of Oxford Street as well as providing a number of key north-south connections across the district and more cycle parking.